It’s the end of the night. You’re walking home on your own. Wait for the police to arrive. For judgement, for justice, whatever that may be. You just hope you husband, family and friends, everyone you love, will stand by you. I received an e-book copy from Penguin UK in return for an honest review. I’ve seen this book in the top sellers a lot around the UK and have heard it being compared a lot to the film sliding doors, so I thought, why not give this book a go as I’ve seen the film a long time ago and enjoyed it. You meet Joanna / Jo, as she is on a girls night out with her best friend Laura having drinks until they receive some unwanted attention from a guy. They try to ignore the guy and get away from him and carry on their girls night out, but he keeps approaching them and takes a selfie with Joanna. They manage to leave and end the night by parting ways in different directions. Joanna hears footsteps behind her and thinks its the guy that was previously giving her unwanted attention so she quickens her pace and calls her husband who is at home waiting for her to let him know that shes on her way home but thinks shes being followed. The mobile phone cuts in a dead spot and it is soon Joanna and the guy behind her in a secluded spot. Feeling threatened, she pushes him when he approaches and the guy ends up on the floor and isn’t moving. After this event, the book is spilt between chapters which show how her life would turn out if she conceals (leaves the guy on the floor and walks away) or reveals (calls an ambulance for the guy on the floor). 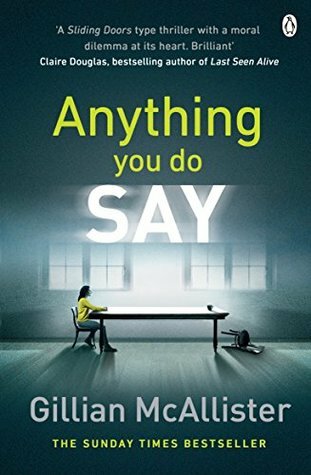 I did enjoy this book a lot and you follow Joanna as you see how different her life turns out between the conceal and reveal chapters, the effect that pushing a guy down onto the floor has on her friends, family and husband. You do find yourself glued to the book as you can sympathise with Joanna being afraid and pushing and not knowing what to do. I wouldn’t have predicted some of the things that happen towards the end of the book, but I did enjoy how the two stories merge into one in the end and there is a conclusion so you’re not left wondering about any cliffhangers. I would highly recommend this book as it keeps you gripped and the telling of the characters is done really well.